Let's kickoff our celebration of Bracq Friday with a classic Paul Bracq designed coupe from Mercedes. Not the SL, because you need to be a banker or a gangster to afford one of those, but the still expensive W111 Coupe. The W111 coupe was built from 1961 to 1971 and it overlaps production of the W111 and W108 sedan chassis. The later (post '65) W111 coupes could be considered a W108 coupe, but the two door versions offer an immensely long hood and graceful rear glass shape at the price point of a new mid-sized family sedan. 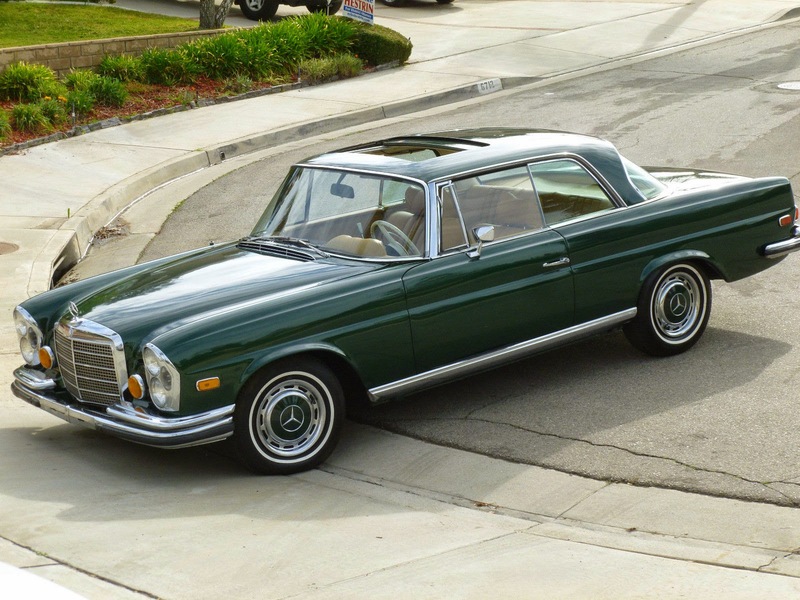 Find this 1970 Mercedes-Benz 280SE W111 Coupe here on eBay , currently bidding for $25,400 with 2 days to go. The W111 coupe is another example of Paul Bracqs design work when he was working for Mercedes-Benz. The W111 sedan (designed by Friedrich "the Count" Geiger) featured prominent tail fins topped with chrome strip, but the coupe version had barely noticeable bulges on the top of the rear fenders -- just a hint of some Heckflosse. Power comes from the M130 inline-6, a 2.8 liter fuel injected engine that puts out 160 hp and gives the handsome coupe a top speed of 120 mph. Performance with the automatic transmission is leisurely with 60mph passed in about 11 seconds, but your back seat passengers will be lathering Grey Poupon on their toasted rye bread and any AMG-like acceleration could result in an accidental butter-knife stabbing. 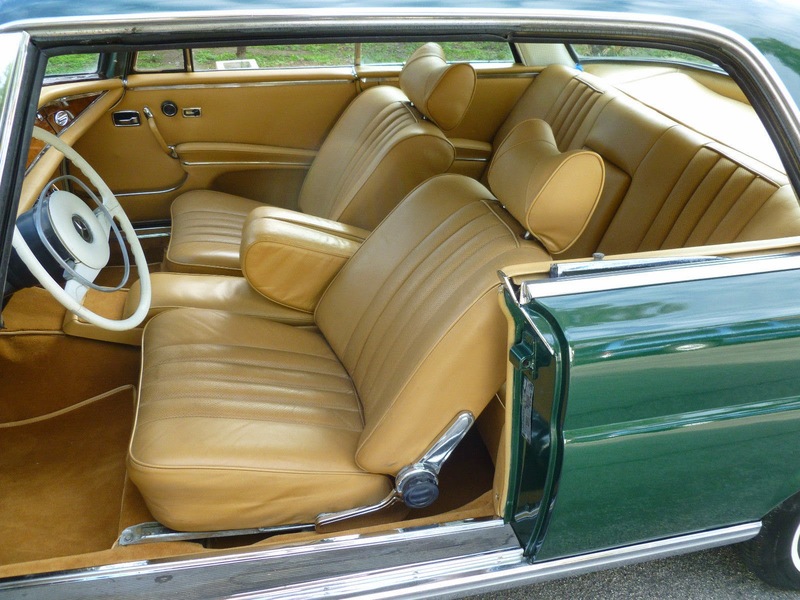 The inside of this particular car looks very nice in the pictures -- the seller has done an excellent job of staging the car and taking decent pictures, but the steering wheel does show typical cracking of the plasticy white stuff that surrounds a metal frame. Yeah, do you remember when cars were designed so you could actually see out of them? This coupe is indeed lovely. I imagine such a car becomes a life-long companion. Too bad about the automatic (IMHO). In general, the photos seem to show that the beauty is not just skin deep. I would wish for photos of the bottoms of the doors, not the ubiquitous (and largely pointless) high-angle shots. Talk about an incredible line up, they (MB) were offering this, and the 280 SL at the same time. Beautiful, solid and timeless. Seller has an 89.3% positive feedback. Therefore, pre-inspection is highly advisable. But when is it not?